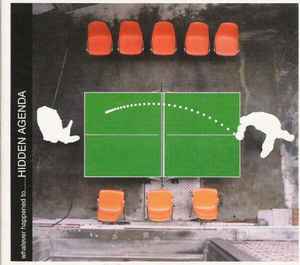 Hidden Agenda, formerly of the Metalheadz camp, finally release their aptly titled album, Whatever Happened To…, but those folks expecting more jazzy drum ‘n’ bass that marked their 12”s will find them in short supply. Instead, they concentrate more on breaks and electro, as evidenced by the first two tracks, “Salvation” and “Something Somewhere,” respectively. “Low Jazz Fidget” is only a crazy swing jazz interlude, one that leads into the breaks of “Redress.” “Inside-Outski” gets more melodic and, therefore, more interesting. “Vindication” finally gets to the drum ‘n’ bass we’ve been waiting for, and it’s a sweet piece of work. A mixed bag, overall, but worth the wait and the answer to a long-burning question.